Red Turf Ranch was named after a beloved horse, Pacman's Red Turf who was the pride and joy of the Travis family. 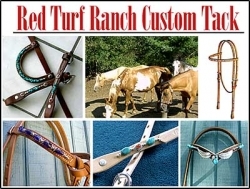 Gail Travis the sole owner and designer of Red Turf Ranch Custom Tack. The business had a simple beginning: not being able to find any Turquoise or gemstone tack for her personal use, Gail designed and created a few pieces for her own horses. Soon the compliments started and others wanted to know where this awesome tack came from. The design ideas grew along with a huge list of available Turquoise, precious gems and Sterling Silver.